Autorizzazione e rimborso sono ora disponibili per i pagamenti nella reception dell'hotel. Le prenotazioni effettuate tramite la tua reception e il Booking Engine con una carta di credito possono essere convalidate con il tuo processore di pagamento. Qualsiasi pagamento per una prenotazione attiva può essere rimborsato, con i fondi emessi tramite il processore di pagamento nel caso di pagamenti con carta di credito. 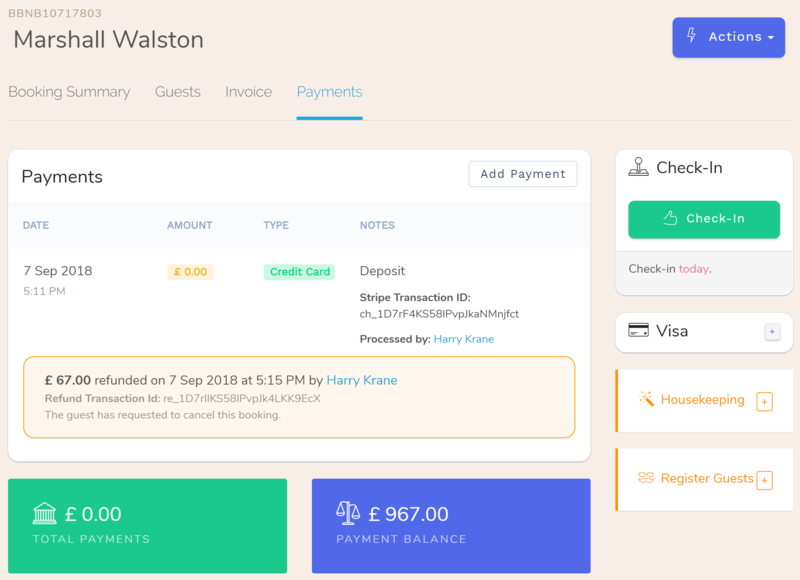 Se hai abilitato il tuo Payment Gateway, ora hai la possibilità di convalidare le carte di credito per le prenotazioni effettuate tramite il tuo Booking Engine o Front Desk. Per abilitare la convalida della carta, vai su "Impostazioni> Gateway di pagamento" e fai clic su "Modifica". Seleziona la casella "Convalida schede" e fai clic su "Salva". Le prenotazioni effettuate presso la tua reception che includono una carta di credito (opzionale) verranno convalidate con il tuo processore di pagamento. Se hai abilitato le carte di credito nel tuo motore di prenotazione (Channel Manager> Motore di prenotazione> Impostazioni> Modifica) tutte le prenotazioni effettuate tramite il tuo motore di prenotazione verranno convalidate con il tuo processore di pagamento. The way authorization works is a $1 (or 1 EUR, 1 GBP, etc.) authorization is made on the credit card through your payment processor. If the card is valid, the authorization is immediately released. Authorization only guarantees that the card is valid, but not that it has enough funds to pay for the total cost of the reservation. If you like, you can process a Deposit payment when you receive a new booking. You should let your guests know if it is your hotels policy to charge a deposit at the time the reservation is made. Don’t worry, you can issue a refund later on if you need to (see below). Authorize charges will show up in your payment processor’s dashboard in a variety of ways. In any case, authorized funds are voided immediately after validation. This is to avoid confusion. You don’t want someone to go through and accidentally capture (i.e., fully process) the $1 authorized charges left behind in your payment processor. Because authorizing charges leaves a trail with your payment processor, we have made authorization optional. You can choose to disable it and accept all credit cards with no validation. An alternate route is to process a deposit as soon as a new booking arrives. This way, you validate the card by default. Authorize only applies to direct bookings made through the Front Desk and Booking Engine. Channel bookings that include a credit card are not validated, but you can process a deposit as soon as the booking appears in your Inbox (Reception > Hotel Activity). You can now refund payments in your Front Desk. In the case where the payment did not go through your payment processor, the refund is recorded along with the original payment. For payments captured via your payment processor, a refund is issued to the original card through the payment gateway. 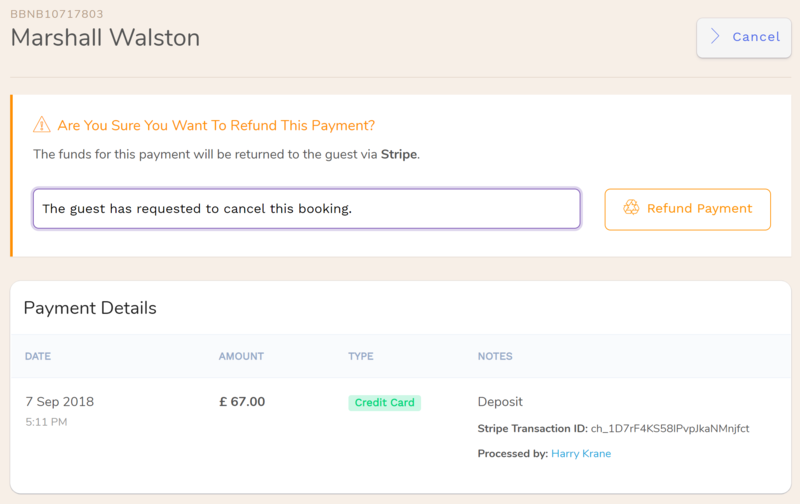 To refund a payment, go to the ‘Payments’ tab in the booking, the click the ellipsis to the right of the payment you wish to refund and select ‘Refund’. Enter a reason for the refund and then submit the form. The refund operation is irreversible, so be sure you really want to issue a refund. The refund information will appear beneath the original payment, with the payment’s amount set to ‘0’. Each refund transaction will indicate when the refund was made, by whom, and the reason why. In the case that the payment was captured through your payment processor, the refund transaction Id will also be available. Refund information will appear in any reports you generate. Payments are not refunded when a booking is cancelled or deleted, and refunds can only be processed while the booking is active. Refunds are not available once a booking has been checked out or cancelled (i.e., the booking has been closed out). 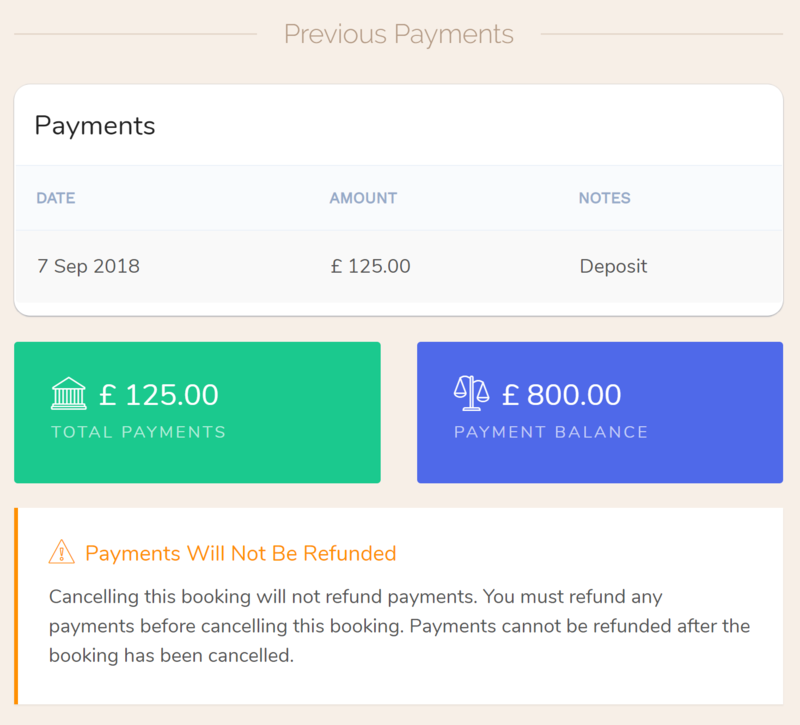 If you need to cancel a booking and return a payment, make sure you refund any payments BEFORE you cancel the booking. Note to Authorize.net Users: to perform refunds through the Front Desk you will need to enable the Transaction Details API in your Authorize.net account. To enable, log in to your Authorize.net dashboard and go to 'Account > Settings' and click the link for 'Transaction Details API' under 'Security Settings' and follow the instructions to enable. Authorize and refund are important operations that help you get the most out of your property management experience. To help keep your books balanced, refund information is now available directly in your Front Desk. 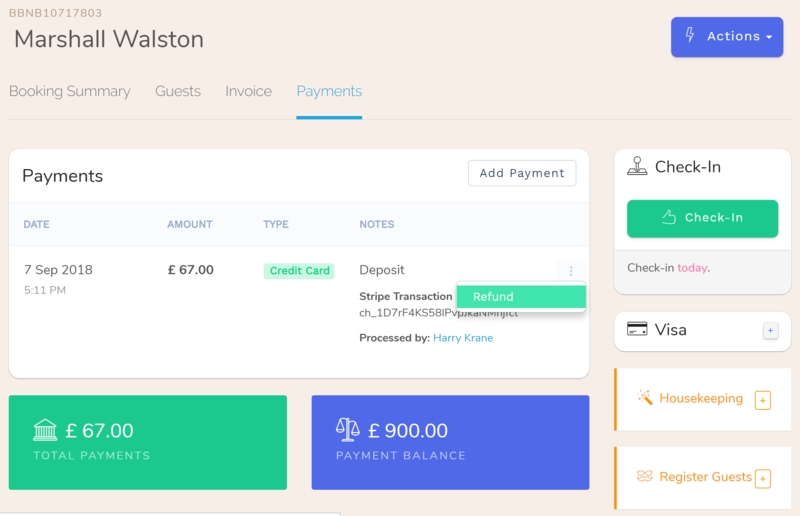 Authorize payments in your booking engine and add a captcha to ensure your bookings are from real guests.